The Amerock BP1585FB Inspirations 1-1/4in(32mm) DIA Knob is finished in Flat Black. Clean, classic lines in a casual relaxed style, Inspirations is designed to compliment any dicor. Flat Black is a dark, matte Black finish that subdues the highlights of each design. 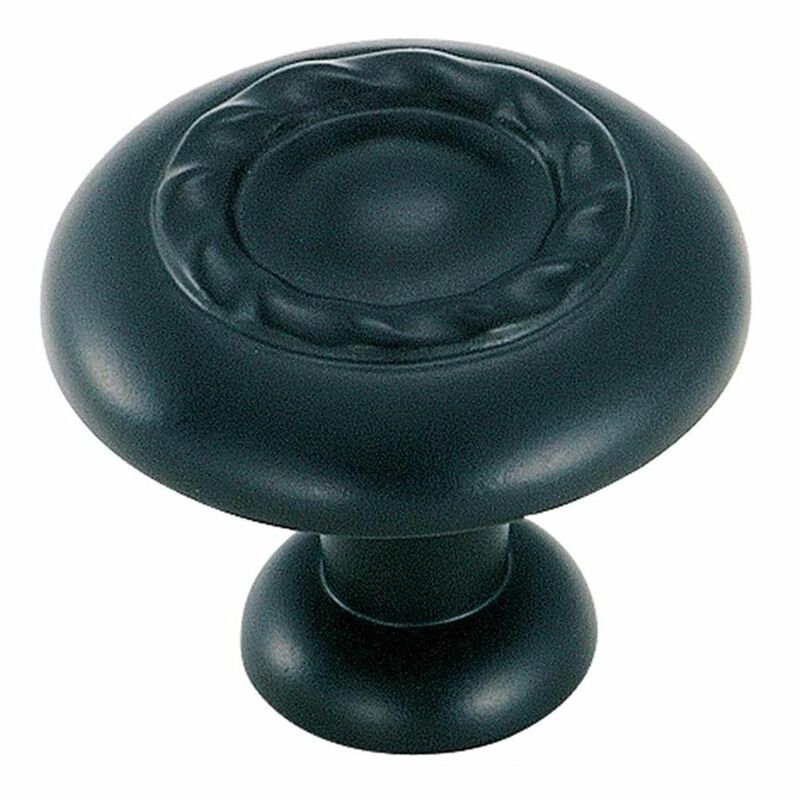 Amerock Davenport 1-1/4in(32mm) LGTH Knob is finished in Oil-Rubbed Bronze. Simple lines and curves paired with strong, subtle finishes give the Davenport collection a distinct appeal. Installed horizontally or vertically, the balanced lines of these cast metal knobs and pulls add refined geometry to any space. The Oil-Rubbed Bronze finish is a rich, dark brown old world finish with striking light and dark accents. Inspirations 1-1/4 Inch (32mm) DIA Knob - Flat Black The Amerock BP1585FB Inspirations 1-1/4in(32mm) DIA Knob is finished in Flat Black. Clean, classic lines in a casual relaxed style, Inspirations is designed to compliment any dicor. Flat Black is a dark, matte Black finish that subdues the highlights of each design. Inspirations 1-1/4 Inch (32mm) DIA Knob - Flat Black is rated 4.8 out of 5 by 5. Rated 5 out of 5 by Jane from Matched knobs I already had.... Matched knobs I already had. Rated 5 out of 5 by JKS from Perfect Fit! Looks great on our cabinets!! We had lost one knob and this replacement is almost perfect. Rated 4 out of 5 by Toby from Nice black knobs I really like how black the knobs are because, it looks more dramatic. Rated 5 out of 5 by EileenG from Beautiful, high quality knobs. Uniform qualilty. Knobs look exactly as shown on website. Fit perfectly on my cabinets. Very nice design and sturdy. All of uniform quality and look great on my cabinets. Rated 5 out of 5 by John from Knobs! These are knobs, which I was happy to find to match some existing knobs. They are high quality and work perfectly. When I pull on this knob the door opens!